For this week's Workout Wednesday, we're kicking things up a notch on the intensity scale! This workout was created at the intermediate level, so if you're not quite there, be sure to adjust your settings to a comfortable level to tackle this one. 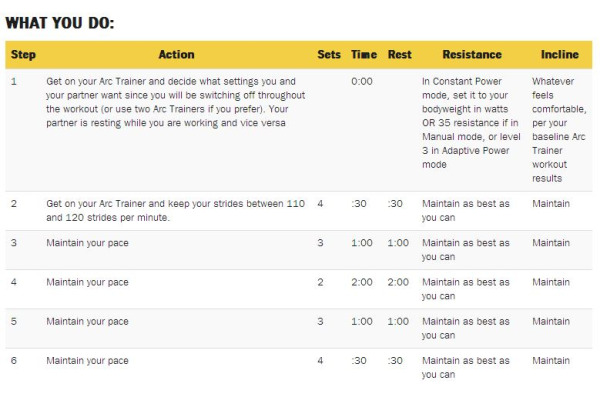 In addition, if you haven't taken the Arc Trainer Baseline Evaluation yet, please do so before starting this workout. Once you are ready to go, this quick, 28 minute ladder-style workout will definitely challenge you. The great part of this workout is that if you have a training partner, the two of you can tackle this workout together, alternating between work and rest periods. If you're going solo for this one, that's ok too! Check out the instructions below and let us know on Twitter and Instagram how you did! Be sure to tag your picks with #CybexSummer and enter them in our photo contest, which you can enter here! I want to know the F,O,R. prices of Arc Trainer and a sort of CARDIO SOURCE ladder also. Thanks again and we hope this was helpful.